FILE - Smoke billows from a coal-fired power plant in Beijing, China, Nov. 13, 2014. China has agreed to implement a cap and trade program to limit emissions, in what could be a crucial step in international efforts to combat climate change. Chinese President Xi Jinping announced the program after he met with President Barack Obama at the White House Friday. U.S. officials said the program will go into place by 2017 and will cover some of the worst-polluting sectors of China's economy. The cap and trade program helps add legitimacy to a landmark climate deal the U.S. and China reached last year during Obama's visit to Beijing, says Ramon Pacheco Pardo, a senior lecturer in international relations at King's College London. "The agreement last year was criticized for being too vague and not changing the game ... just a declaration for political purposes. But now we see it has actual content," Pacheco Pardo told VOA. "Until now China was claiming that developed countries such as the U.S. had been polluting for a long period of time, so China and other developing countries could do the same. But this is a complete reversal in policy," he said. Under the deal reached in November, the U.S. agreed to reduce its emissions by 26 to 28 percent, over the next 10 years. For its part, China said CO2 emissions would peak there by about 2030. 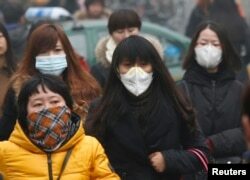 It was the first time that China, the world's top polluter, had committed to such a date. 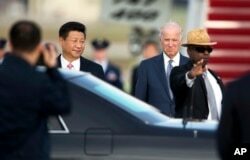 Chinese President Xi Jinping (l) and Vice President Joe Biden during the arrival ceremony at Andrews Air Force Base, Md., Sept. 24, 2015. Under a cap and trade program, China would set a limit on its annual amount of emissions. Companies could then buy and sell permits that allow them to pollute a certain amount, and would be given financial incentives to pollute less. But there are concerns that China may not be able to enforce the program adequately, Pacheco Pardo said. He noted that China's regional governments may be more interested in preserving economic growth than in reducing pollution. "The central government in Beijing has to make sure regional governments follow suit," he said, "and that has not always been the case in the past." China may also lack the technological capability to implement certain aspects of a cap and trade program, the London-based expert said, and may be reluctant to allow outside observers to confirm its progress on emissions reductions. FILE - Commuters wearing masks make their way amid thick haze in the morning in Beijing, Feb. 26, 2014. Anna Lora-Wainwright, a lecturer in the human geography of China at Oxford University, called the announcement "significant," but she also cautioned against rushing to conclusions. In an email to VOA, she noted that China has in the past attempted to implement pilot cap and trade programs in some of its key manufacturing hubs. "In 2009, Beijing, Shanghai and Tianjin introduced the first voluntary carbon cap and trade schemes. China has also already taken steps towards market-based electricity pricing to reflect the actual cost of power generation. Economic instruments are already widely introduced in other sectors," she said. Lora-Wainwright also warned against cap and trade programs being seen as a "panacea." "Critics have long pointed out that carbon offsetting is essentially unfair. It may not lead to global emission reductions, nor help developing countries, but rather provide ways to avoid cutting emissions," she said. "This might exacerbate existing economic divisions within China, and effectively translate into powerful industries buying the right to pollute, rather than giving them an incentive to pollute less."